(CNS): A rise in sea levels by a metre from climate change could destroy more than 60 percent of the developing world’s coastal wetlands, according to a World Bank study. Predicting economic losses of around $630 million per year, the global bank said 76 countries and territories are at risk and the Caribbean stands to lose more than a third of its coastal wetlands to the ocean. 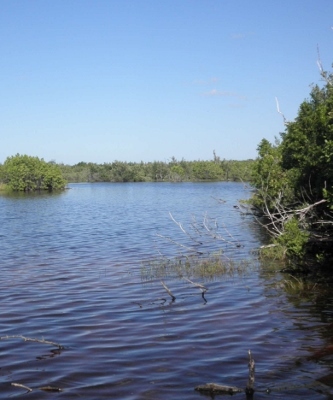 In recent years, coastal wetlands have been disappearing more quickly than other ecosystems, mainly because of land development. Sea-level rise from climate change will exacerbate these losses. The rise in sea levels will lead to wetlands being submerged, pushed inland, or blanketed with salt. The resulting economic losses from coastal wetland destruction will be in addition to other coastal impacts, such as the forced relocation of people and infrastructure. The World Bank analysis considers a variety of types of coastal wetlands at risk in 76 countries and territories, using a number of databases and satellite maps. According to the data, about 99% of the coastal wetlands at elevations of one metre or less in the Middle East and North Africa could disappear, as well as 77% in sub-Saharan Africa, 66% in East Asia and 39% in Latin America and the Caribbean. See full World Bank study here. Armegeddon is coming, impose taxes to stop global warming! As we all know, taxes are the solution to every problem. This article begins with the assumption that global warming is causing the sea to rise. According to an article I just read, the earth has cooled by .7 degrees during the last century. Read "Where Does the Carbon Really Come From?" In 2009, Plimer released Heaven and Earth, a book in which he says that climate models focus toostrongly on the effects of carbon dioxide, and do not give the weight he thinks is appropriate to other factors such as solar variation. Critics of the book have accused Plimer of misrepresenting sources, misusing data, and engaging in conspiracy theories. Some critics have also described the book as unscientific, and argued that it contains numerous errors from which Plimer draws false conclusions. I've been trying to find a link to the 200mpg carburetor that the oil companies have been keeping a secret. Do you have the link for that? Dr someone with Dr in front of their name should select better sources of data. That site looks like a child design it certainly not one that a doctor should quote as a reliable source. Anyone who can say that the earth has cooled is really lost. If you are going to contend against it at least say you dont believe it is caused by burning fossil fuels. Excellent reading, it just goes to prove that the main threat to our existence is Human Beings..
For an island with elevation as low as ours, this proposes to be a particularly threatening problem. We need to ensure the health and safety of our wetlands and our mangroves. If nothing is done to protect these at risk environments, I fear our islands will suffer tremendously. The mangroves protect our island in hurricanes, anchor the sand to our banks so that it is not as easily washed away by erosion during high tides and heavy rains, provide habitat for many different species of birds and other animals as well as hatching grounds for the multitude of aquatic life that will eventually inhabit our reefs and coastal waterways. Just how long do you think our tourism industry will last if people can't come down here and experience our thriving dive sites? But will anything be done? Ask a politician. Well it was like I have been saying fill in the swamp. At the same time we get rid of the mosquitoes too. God I wish I have money to fill in my swamp. I would make it 20 ft higher and wait till the same people who complain about "protect the swamp" come to buy a lot. 1) How might this affect the price of property? 2) What do all you environmentalist expect to do about the water rising? 3) Are you going to stay on the beach when it comes? 4) Will you be the first to build walls on the seaside? 5) Will you tell everybody that if we protect the swamp here it will help to keep the water from rising ? 6) Will your next alternative be like Venice? 7) Are you all serious, WE ARE THE ONES that by protecting our swamp in Grand Cayman will stop the rise of water? Interesting comment! Most anything is possible, but sea water rising enough to alter our lifestyle will not come in our lifetime. Sea level does rise and fall but it is an extremely slow process. Of course, the land itself sometimes subsides in some areas. Like Venice and New Orleans but it can also rise, like Cayman Brac or in the extreme like the Himalayas, where they have been created by the subduction of the Indian tectonic plate under the Eurasian Plate. The earth is constantly changing, but generally very very slowly. Eat, drink and be merry! How might this affect the price of beer? It's amazing that man made climate change is such a taboo subject nowadays, that 50% of Americans now even refuse to accept that even climate change exists (so they don't beleive there was were ice-ages, or they simply refuse to try and understand the meaning of climate change). It is like standing in front of a train and refusing tomove as you don't believe the train is driven by a human driver. It's still going to kill you if it's automated or not,. climate change?…rising sea levels?…. lets do the caymankind thing and stick our heads in the sand…..